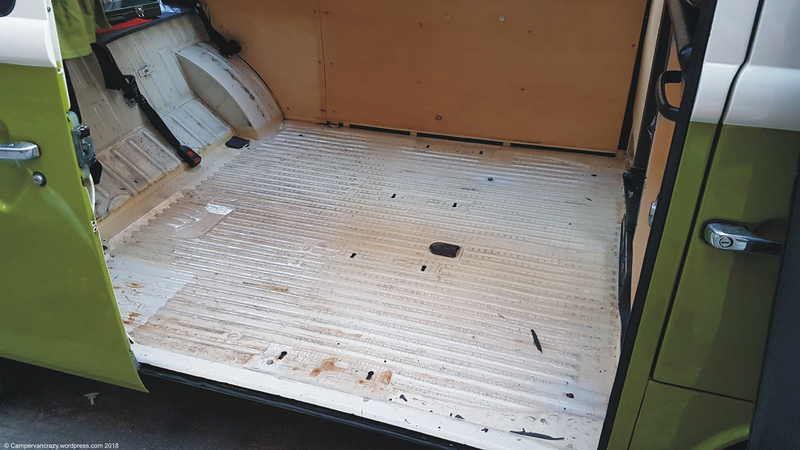 The big rebuilt: Turning a campervan back into an 8-seater! While I was at it, I also added the roof rack and the bike carrier for the big trip. Now that the bed goes out, the spare tire can go into the back of the van. The spare tire holder on the roof rack had to be removed again to make space for the roof box. 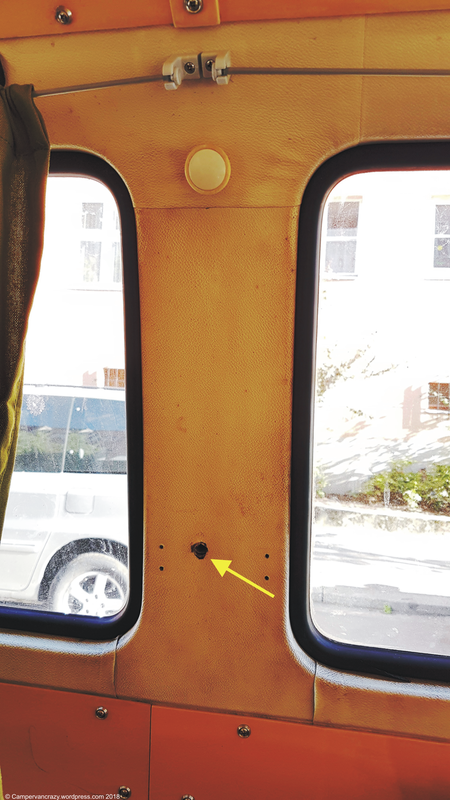 The little yellow arrows indicate the safety belt anchor points in a 1976 T2b VW window bus (L version). The blue arrows show the attahment points for the bolts holding the middle bench. 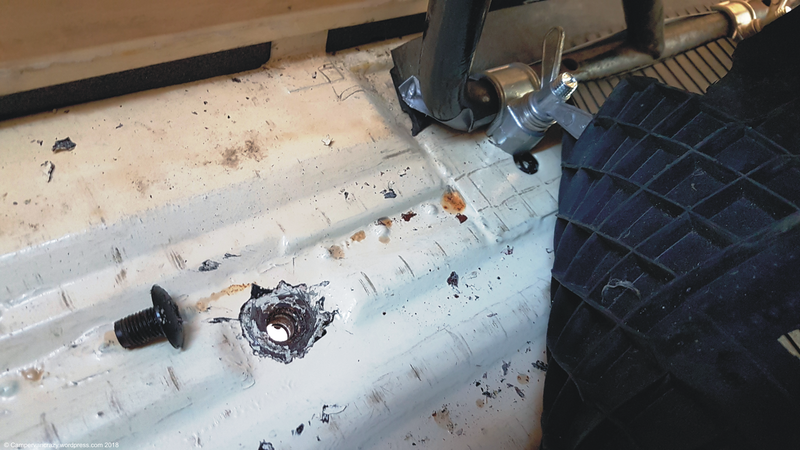 The anchor points on the floor were still covered with the original plastic screws which I had painted over in 2010 when I de-rusted the back section. I think I was not even aware what they were at the time. In went two Volkswagen T2b back benches: The rear in black came with Taiga Lily when we bought her in 2010. So this is the original black upolstery Taiga Lily came from the factory. It was installed for a short while when I attached the rear safety belts and before I built the rock and roll bench. 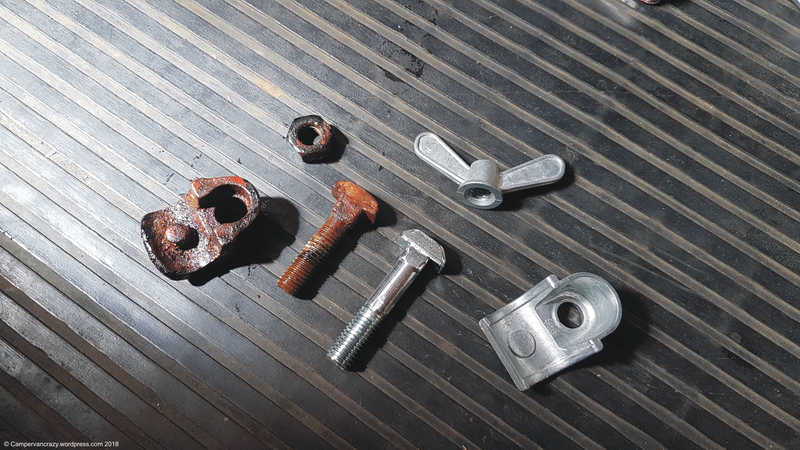 The middle bench was an Ebay purchase from 2013, but had never been installed properly in the bus because the anchor points had not been accessible under the floor plate. At that time I had to take what was on offer. Which was a middle bench in Volkswagen basket weaven in gray, not black. 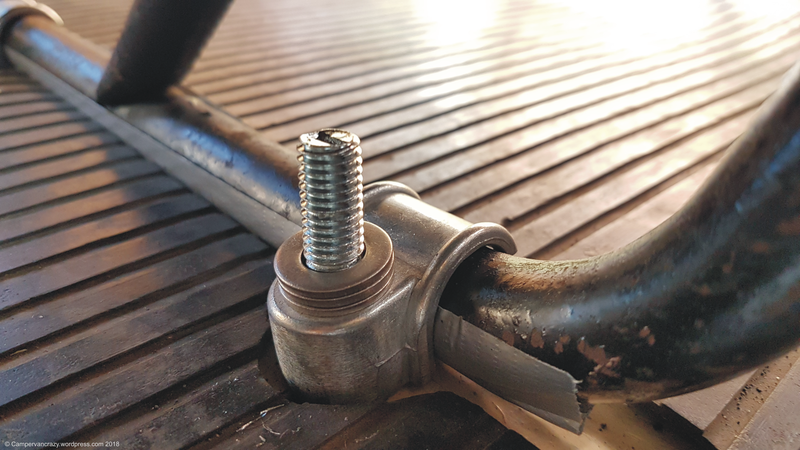 The screws to bolt these two benches into the anchor points in the floor plate are different for the two benches: The ones for the rear bench come with a little nob that slots into a hole on the foot of the bench. 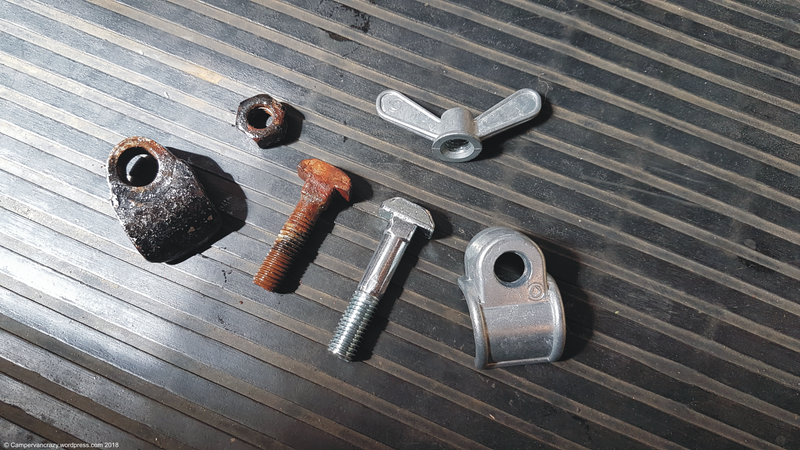 I luckily found these two bolts still in the pile of things I got from the previous owner. The ones for the middle bench I purchased via Ebay in June this year. Based on the packaging they come originally from Brazil where the T2 bus was built till the end of 2013. 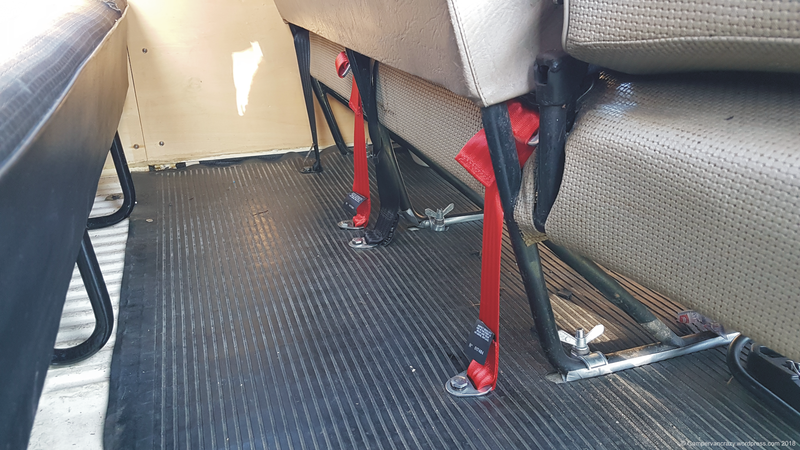 Another couple of hours went into installing two more seat belts for the new middle bench: I bought two 3-point-belts from JustKampers (JK part no. J10652), and both come with a red extension belt extender to make up for the long distance from the cabin floor to the bench. 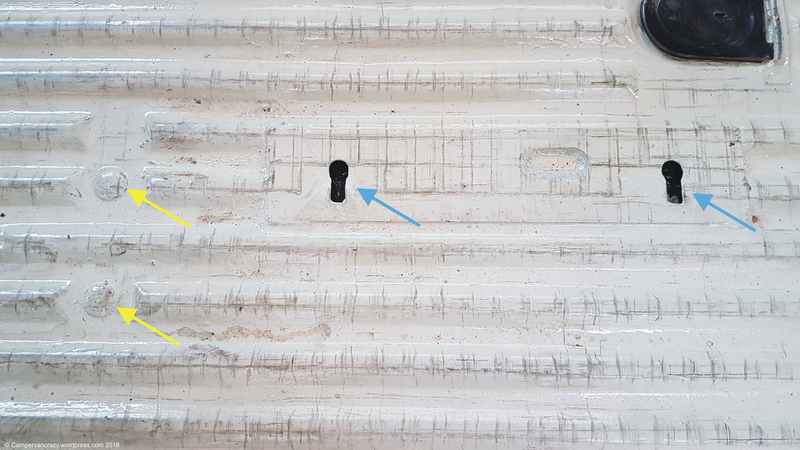 For the anchor point in the left C column I only had to cut away a bit of the lining on the wall and move my curtain holders some 10 cm higher. 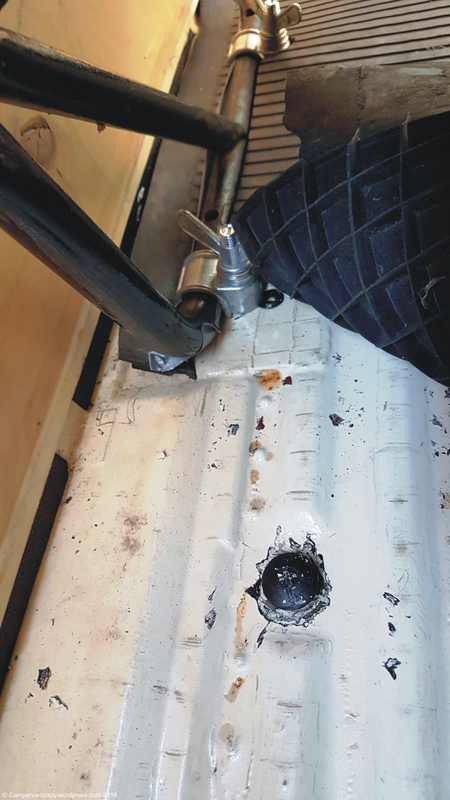 The two other points on the floor took some time because the plastic lids had been covered so thoroughly with paint: After lots of scratching the paint off and letting WD40 soak in, I could finally screw the lids out of the anchors points and screw the safety belts in. 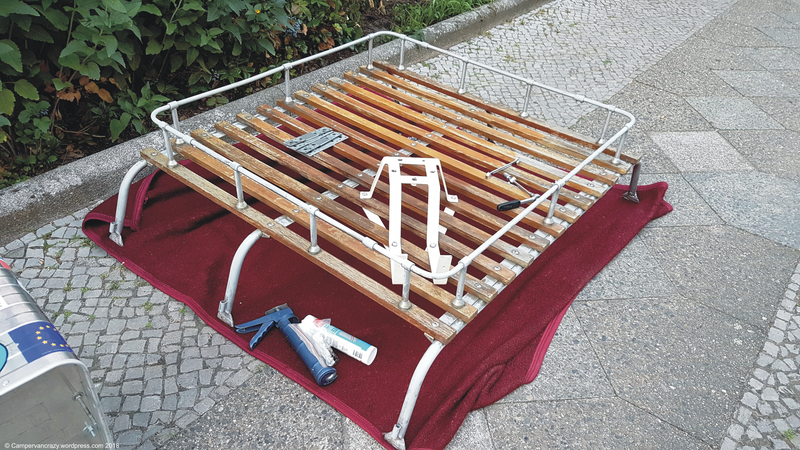 The red extension (see photo below) is indeed needed so that the buckle reaches up to the bench. For the middle seat I used a 2-point hip belt (also from JustKampers) which had to be extended with one of the red extension pieces as well (borrowed from a second 3-point belt I had ordered from JustKampers). 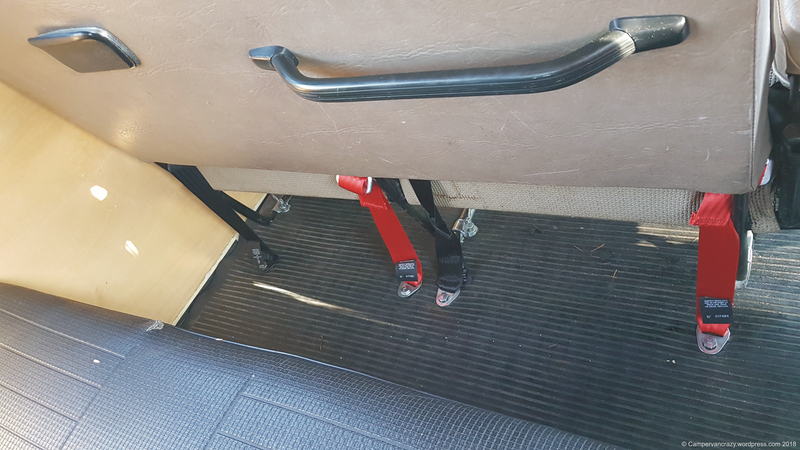 For the moment I did not install the second belt on the right seat on the middle bench: With one anchor point in the C column and the second point just behind the middle bench, a 3-point belt for this seat would block the way for anyone who wanted to enter the third row. Not good. Will order a second two-point hip belt to have at least some safty belt on that seat. So, for the first time Taiga Lily is now a real eight-seater, and six of these come with a safety belt! All is ready for the trip to Czech! What a difference a few curtains make! 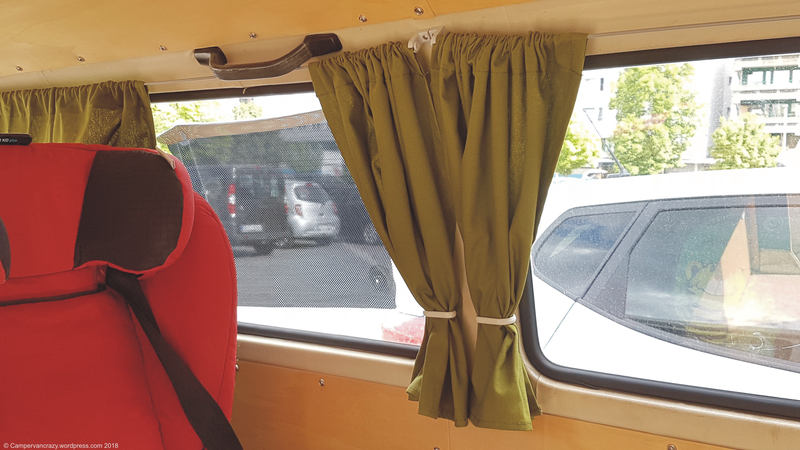 I bought this curtain set already in 2015, from an Ebay seller (Volksrent24) who (at the time) seemed to have specialized in sewing these sets on demand. They cover all 8 windows of a late bay bus and were offered in green, yellow and orange. I bought the green set for Taiga Lily. It took me another year to get around ordering the REIMO curtain rail installation kit (product number: 56251). 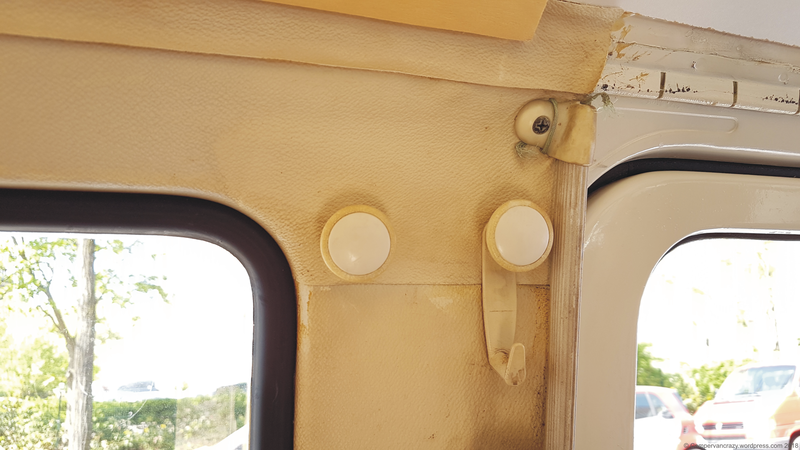 For each window in the back, two holders for the wire at the top and two curtain holders left and right of the window have to be fixed with screws to the side walls. 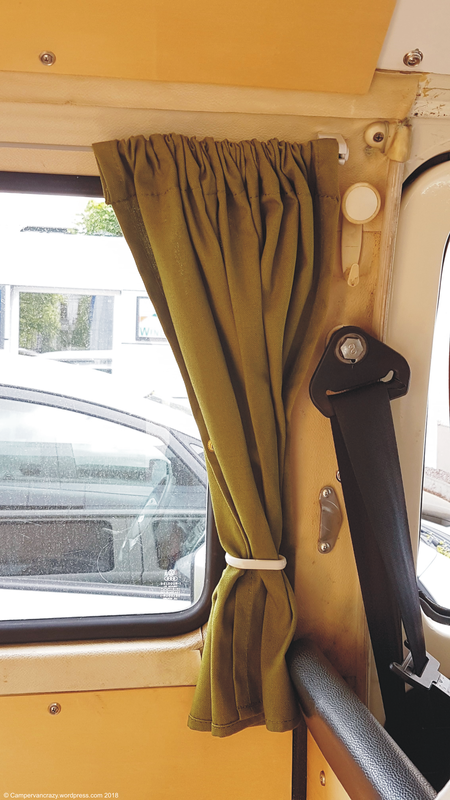 The curtain for all three windows in the front cabin comes in one piece with a rubber band sewed in at the top and is then attached to the wall via 6 push buttons (which were also part of the REIMO set). The REIMO set was delivered in November when Taiga Lily was already in her winter sleep. So when she came out into the sun in May, it finally happened. The curtain holders look a bit like cheap plastic on their own, but do their job very well. 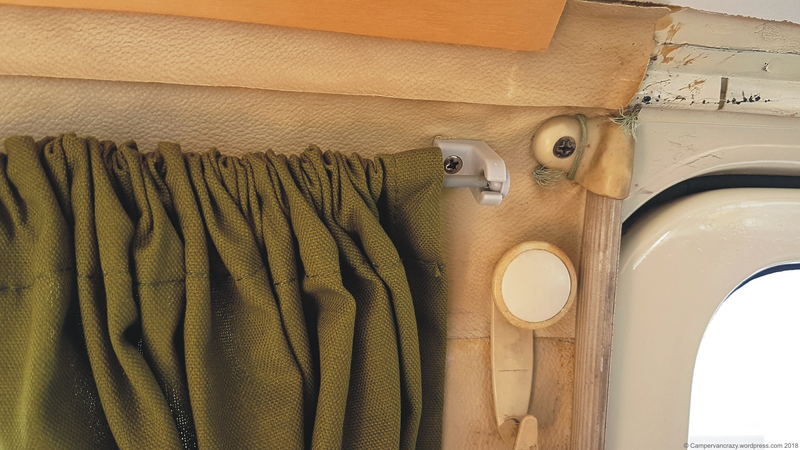 The wrapped up curtains are quickly folded behind them and stay in place. Also, I am very happy with the color, works better with the sage green of the car and the green plaid of the bench cushions then I had expected. Soundcheck: Taiga Lily goes to the movies! 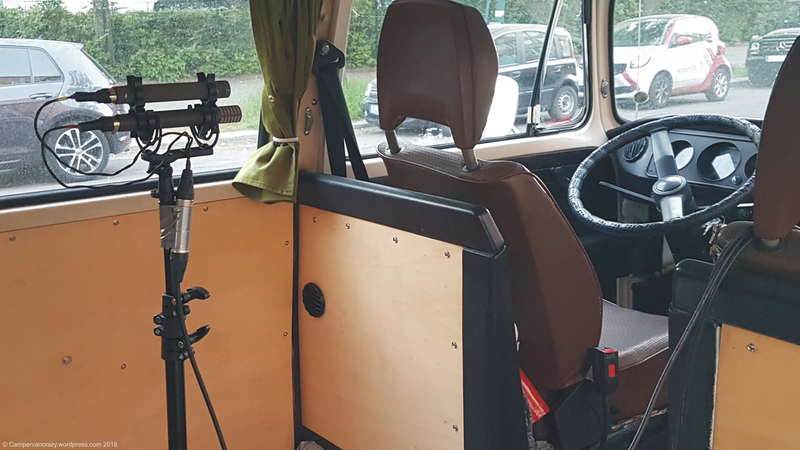 Or at least her engine roar will… Some three weeks ago a friend asked me whether I would be willing to help another friend who needed to record the engine sound of an old Volkwagen bus. 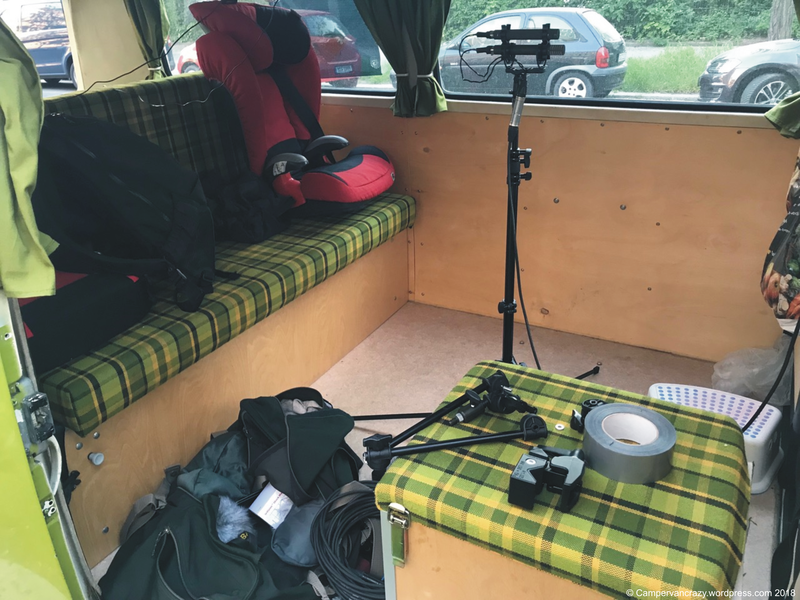 Turned out he is a professional movie sound specialist and is currently working on a Brazilian road movie that stars an unusual looking campervan. 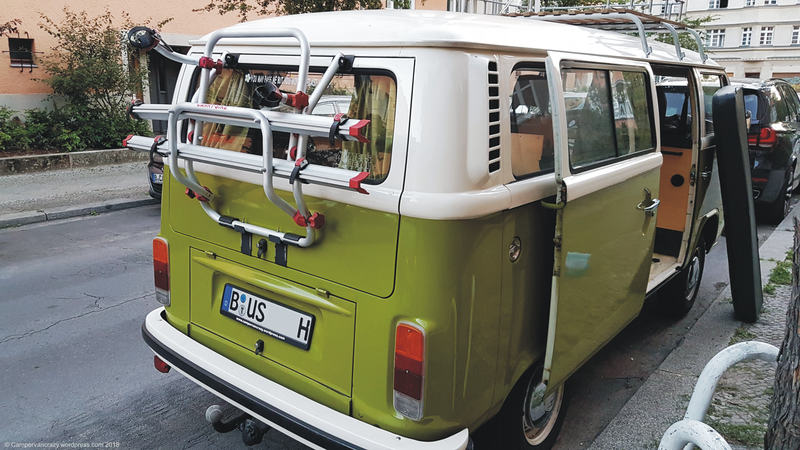 It took them some time to figure out it was a Karmann Safari, a motorhome built on the base of a Volkswagen T2b pick-up truck. And here enters Taiga Lily, not a Karmann Safari, but at least a T2b with the authentic Volkswagen boxer engine sound. So this is what the original Karmann Safari campers looked like (photo from Wikimedia Commons, Rafael Ruivo., Kombi Safari, CC BY-SA 3.0). I learnt only recently that the German car maker Karmann built such motorhomes based on the T2b. Its successor, the T3/T25-based Karmann Gipsy, is more common on the road in Germany and I portrayed one of them here. According to this Wikipedia page, Karmann started making the T2b-based ones in 1974 and built only 1000 in total. So a few days ago said friend of a friend, together with a sound assistant, arrived at our home and we spent 4 hours, first gearing Taiga Lily up with microphones, then practicing drive-bys at various speeds, starting and stopping the van, driving fast and slow on the autobahn (fast being 85 km/h, slow being 65 km/h…), then slow and fast stops, and finally banging the drivers doors. All was recorded from the distance by the assitant and additionally with five microphone in an don the bus: One on the back window, another on the tow bar, yet another in the engine bay itself, another directly next to the exhaust, and finally one on a tripod in the middle of the car, pointing to the driver’s cabin, to also record the sound in the front of the car. Gosh, that was a fun evening! Will keep you posted when the movie is finished. Hope it will make it to the movie theaters in Germany! Summer 2018, here we go! On April 22, a sunny Berlin Sunday morning, we put Taiga Lily back on the road. The battery was not in its best shape, but the engine started after a couple of trials. Great to be back behind the wheel of a kombi! More to follow soon! Happy 40th Birthday, Taiga Lily! Forty years ago to the day, Taiga Lily started her life on the road! She was first registered on June 3, 1976 to her first owner in West-Berlin. 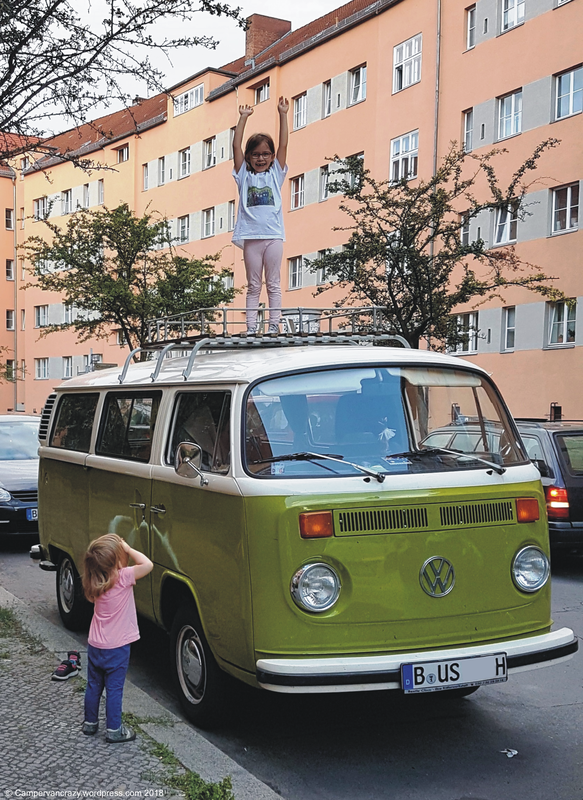 And her M plate reveals that she already was delivered as a sage green and pastel white microbus which she still is today. It also says that she is a 1976 model, but was built already in November 1975 (“planned production date: 25. Nov. 1975”), at the time already for a customer in “Germany, West-Berlin”. Over all forty years her home base kept being Berlin, although she changed hands seven times in those 4 decades: After 2 years she was sold the first time. Owner No. 2 kept her for 21 years and sold her only in 1999. Owners 3 and 4 each kept her for only one year. After almost 27 years on the road, owner no. 5 de-registered her in May 2003. At some point between 2003 and 2010 she was bought by a friend (owner-6) who kept her off the road, took her apart and gave her a fresh paint job (in the original color scheme). We finally bought her in July 2010, partly disassembled and with an engine in very bad condition, but with a mostly rust-free body. Which was already very rare at the time. It took more than a year until she was fully up and running again and passed her exam as a historic vehicle in Nov. 2011. Her mileage over her first 27 years is lost in time. When we bought her in 2010 the speedometer read 79810 km, but it turned out this was totally meaningless since the whole instrument unit is from April 1979, so is not the original one any more. In the 6 years we have her now, we added only 16.000 km, so she really has an easy life with us. And she spends half of the year in winter storage anyway. Hope you will stay with us for a very long time. Her is to you, Taiga Lily! PS: Fotos from last week when we started into a camping weekend. Nice random encounter with another T3 Joker campervan. New Muffler, New Tow-bar, New TUEV! Taiga Lily started the new season with some nice updates. Every two years every car in Germany has to pass a technical inspection with the Technical Surveillance Authority, or TÜV (Technischer Überwachungsverein). Always a time to get the car up to scratch, which this year involved a new muffler. The old one had several rust holes and started sounding like it last summer. Given that it was manufactured in 1989 (before the German re-unification, still stating “West Germany”!) it had served me and the previous owners well. With the new one came a new exhaust pipe, this time in stainless steel (not much more expensive but will hopefully stay longer in good shape). Seeing that we plan to borrow a pop-up trailer caravan from a friend for part of this year’s summer vacation, I got a tow-bar installed! It’s a used one from Oris (Type E 55/3) and in very good shape. Manufactured in 1991 in Germany, it’s the heavy duty version that is registered to tow up to 1800 kg. 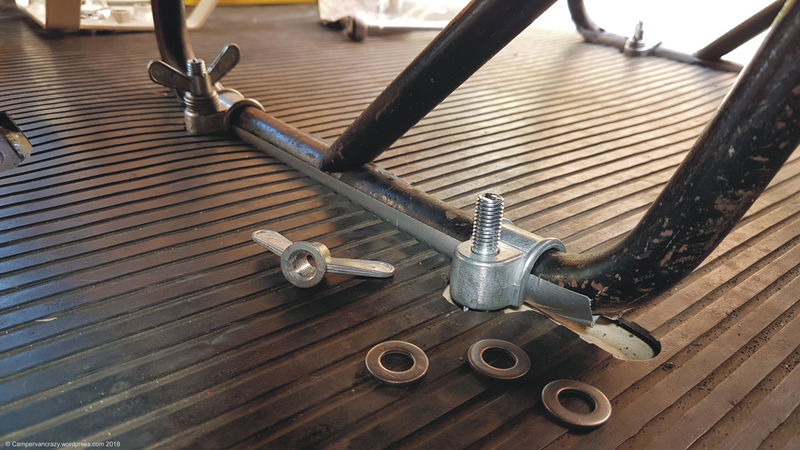 Beetle Clinic added a new socket (13- instead of 7 pins) and attached it to the main frame with the full set of bolts so that the 1800 kg could indeed be towed: Three bolts up into the main frame of the car and two bolts horizontally through the frame, on each side (see photos below). 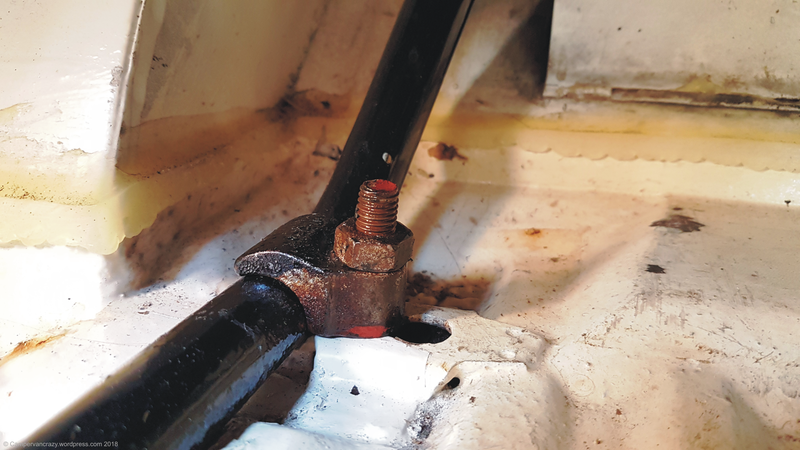 The holes for the horizontal bolts appear to be present in the main frame only from 1977 onwards, so had to be drilled for our 1976 bus. 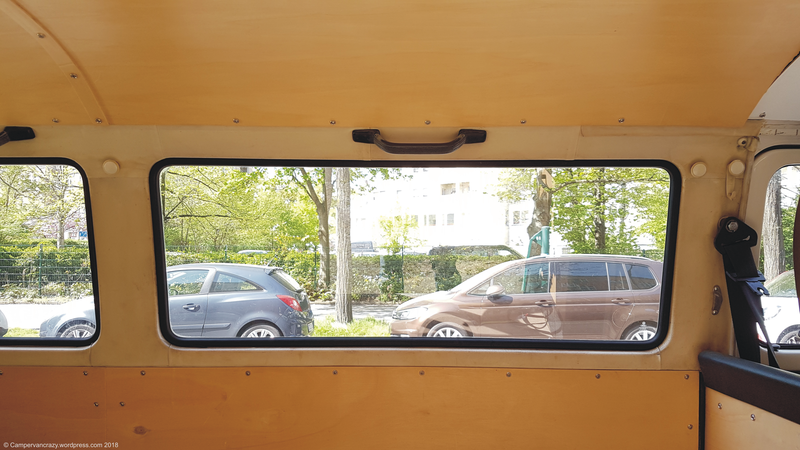 The TÜV examiner was very happy with the installation which makes me happy as well. 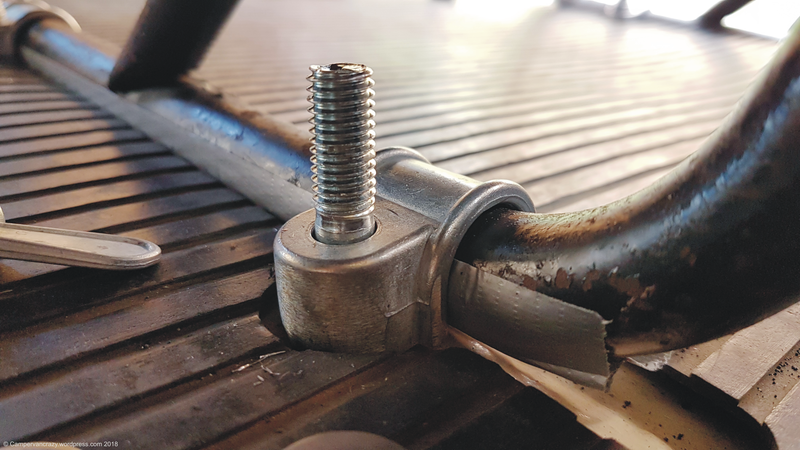 The tow-bar replaces the two original bumper holders and comes with a solid rectangular bar behind the bumper. This bar closes the gap between bumper and car when you look down on the bumper from above. Taiga Lily’s papers come already with a remark for a maximum tow weight, so the new tow-bar does not need to be added in her papers (Fahrzeugschein). Less administrative hassle. According to her papers she is allowed to pull only 1200 kg, not the 1800 kg the tow-bar would be capable of, but the trailer we are planning to use weighs only 650 kg, so all is good. Me and wonder daughter used yesterday’s Father’s Day to get the Porta Potti and its box from the attic, kitted up and into the car. Good to have this option for emergencies when you travel with children. So here we are, ready for the summer! And new TÜV, till May 2018! Brilliant spring day in Berlin and I finally got Taiga Lily out of her winter sleep! The engine started after a few attempts and then ran smoothly. It was good to finally drive a kombi again. Last October she was put away in a hurry and without a wash, so today I spent two hours getting last years dust off of her and there she is, all shiny again. Now she is ready for the bi-annual road worthy exam (TUEV). And then the summer can come! … and all clean again.